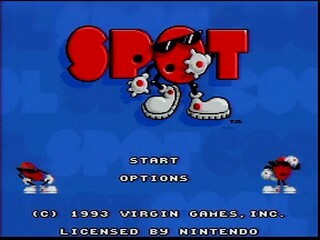 Cool Spot is a 1993 SNES platformer based around the anthropomorphized red spot in the 7 Up logo. No, seriously. Best time on Easy difficulty: 0:11:27 by 'darbian' on 2014-04-11. This is a single-segment any% run on the easy difficulty. The goal in each level is to collect 30 "spots" and then break the lock on the cage at the end. Solid time. Ideally I would not have taken any damage. The trick is to run forward long enough for your speed to increase, then jump as low as possible to avoid the crab. I have a hard time pulling it off, and I don't consider it something worth resetting over. The In-Game Timer (IGT) matches my best of 5:34 remaining. I think 5:35 is possible, but I've never seen it. Really great run of this level until I messed up the simple rope climb at the end. Since the previous parts of the level went really well I decided not to reset. This is one of the more technical levels with a few vertical drops, a tricky damage boost and a ton of rope optimization. I end up with 7:17 remaining, which is 2 IGS off of my best time of 7:19. This is the first level where I usually have to rely on RNG to get through. I intentionally take a lot of damage on this level and count on getting a health drop before the end. I actually get the health drop earlier than normal, but it's enough to carry me to the end. Only real mistake was movement from 7:30 until 7:28 remaining. I end up with 7:07 remaining, which is 1 IGS off of my best run. In this level I utilize the only glitch that I'm aware of in the game. There are certain surfaces that allow you to greatly boost your horizontal velocity when you perform a buffered jump off of them while moving to the left or right. For lack of a better name, I call this trick "super jumping". From my experience, any platform floating in water has this property, as well as the UFOs seen hanging in a few levels (including this one). This is the only level where I utilize this glitch. The only other level where I think it might be possible to use this to save time is Loco Motive. Anyway, for this level I used my safe strat, which requires me to collect a few extra spots at the right side of the map. If you collect enough spots on your way to the other side of the map, you can go to the cage earlier, however it's difficult to get enough spots, perform the super jumps correctly and avoid falling into the water (which is instant death). I end with 7:41 remaining, which is 2 IGS slower than the optimal strats. The only mistake on this level is hitting the thumbtack near the beginning. That cost me at least 1 or 2 seconds. I end up with 7:14 remaining, 1 IGS off of my best time. Of all the levels in this game, I think this one could benefit the most from re-routing. The shortest level in the game, but also one of the trickiest. The physics with the ramps are really weird to me. My strategy is to enter the rolling animation as little as possible. Every spot on my route is important, as there aren't a lot of backup spots to rely on if I mess up. This was a fantastic level for me, and I matched my best time which I had only achieved once before. Great level for me. There's a lot of things that can go wrong here, but I avoided the most serious mistakes. Getting hit at 7:36 remaining cost me some time, as well as some sloppy movement from 7:30 until 7:27 remaining. I end up with 7:20 remaining, 2 IGS off of my best time. This level has ended a ton of my runs, as the most common mistakes can cost over 10 seconds. Fortunately, everything went great. I think the later half of this level could be optimized (the part after ascending in the bubble), which is something I'll look into when returning to this game. I match my best time here. The longest level in the game, and it isn't easy. There's a ton of optimizations to try here, and unfortunately I messed a lot of it up. This was by far the worst level of the run. The first mistake is landing on the ledge with 7:53 remaining. I take a ton of hits early on and nearly die before I'm halfway done with the level, but I get an incredibly lucky health drop with 7:35 remaining so I end up not wasting any time trying to avoid hits. Getting hit that much did cost some time though. I miss a couple of spots on my way to the end, which requires me to gather of few of the extras above the cage. Since I rarely end up in this situation, I actually forgot the positioning to shoot the cage from the top-left and end up guessing wrong. This cost me at least 2 more seconds on top of the mistakes I had already made. I end up 4 IGS off of my best time. This is the most terrifying level of the run. There's a lot of tricky platforming here, and optimal jumps require you to flirt with a couple of ledges where a fall will end the run. I usually require one health drop sometime after the beginning of the level since there's a lot of intentional damage early on. Unfortunately, I don't get it. At 7:19, I'm one hit away from death when I have to attempt the hardest jump in the game. This is the jump at 7:18 remaining. If you're short, you'll hit the clam and not have enough speed to make it. If you jump too far, you won't be able to jump before falling off the tiny ledge. Even if you get it right, the bee can randomly hit you. Miraculously, I get through it, however the optimal strats require me to take at least one more hit. I end up getting an extremely lucky health drop from the next enemy (getting hit a few milliseconds later) which saved the run. I actually end up matching my best time. This level made the run. The last level. This is a pretty simple level. The very beginning is probably the hardest part as you need to act quickly to get the correct spots right from the start. The only mistake you can really make is failing to grab balloons (which has killed at least one other WR pace run). Nothing goes wrong, and I match my best time for this level. With current strategies, I'd say this run could be anywhere from 6 to 11 seconds faster. I don't think I'll be attempting any more runs without finding more routing optimizations. Shoutouts to Mr. K for doing all of the initial routing for this game, and documenting his findings in the SDA thread.